Get to the beach early and claim you piece of peace and tranquility. The call to Maine beaches is what makes our part of New England unique and special. You could visit a beach a day and stay for a week and if that’s what you’re looking for, you’ve chosen the right hotel! Think of our relaxing hotel as a beach compass. You can reach all beaches from our central location! The nearest beach to our hotel is the very popular Wells Beach, which offers 7 miles to explore or just relax in a chair and watch the waves. Go right out of our drive (Rt.1 South) and Wells Beach is located just over a mile from our hotel. Turn left at the light (Circle K gas station) as you continue down Mile Road. When you reach the end of the road, you are there. Limited parking. You can also take the trolley directly from the corner of our driveway and forget about any parking hassles. Crescent Beach – As you approach Wells Beach (above), take a left onto Atlantic Avenue to the end point. Crescent beach offers views of the entrance to Wells Harbor and the Webhannet River. If you don’t want to drive, take the trolley from the corner of our driveway directly to the beach (get off at Crescent or Wells beach) or you can pay to park and take the trolley to Wells Beach, which is the next trolley stop! Moody Beach – As you approach Wells Beach (above). Turn left at the light (Circle K gas station) and continue down Mile Road towards Wells Beach. Turn right onto Webhannet Drive. Travel along the ocean and keep left onto Ocean Ave. At the end of the road you will discover Moody Beach. Moody Beach is a great spot to walk or to watch the dramatic rise and fall of the tide. You can walk for miles on Moody Beach which eventually becomes North Beach, then Footbridge Beach until you reach Ogunquit Beach*. A cautionary note: be aware of high and low tide times so as to plan a wonderful walk to remember. No trolley service. Another beautiful Wells beach is on Drakes Island. Drakes Island Beach is reached by taking a left out of our drive onto Rt. 1 North to Drakes Island Road. Turn right at the blinking yellow light onto Drakes Island Road. Just before you reach the water’s edge, look for pay to park (Gross lot) parking on the left. Another opportunity to enjoy the beach is to continue to the end of Drakes Island Road, turn right onto Island Beach Road to the end where you will find pay to park (Jetty lot), restrooms, and life guards on duty in season. No trolley service. 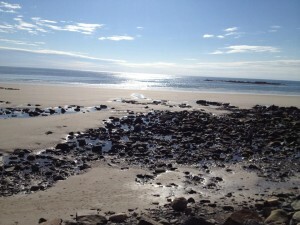 Nearby Ogunquit beaches* are a short trip, starting with Footbridge Beach that you reach by (Yes! It’s true!) a Footbridge from Ocean Street. Ogunquit Beach is 3.5 miles long with soft white sand. The southwestern most point of Ogunquit Beach is Main Beach. It is the most popular beach in Ogunquit since it is closest to parking from Beach Street and the inlet of the Ogunquit River – a fun place to ride the river current and tide on tubes or floats. The Shoreline Trolley goes to Ogunquit center. You can catch the trolley from the corner of our property. From Ogunquit Beach you can walk the Marginal Way, an oceanfront walkway that takes you all the way to Perkins Cove to see the unique draw bridge, small beach and of course, boutiques, wine bars and restaurants (check out Barnacle Billy’s est.1961 – a classic local seafood restaurant known for lobster, rum punch & celeb clientele. It is open seasonally). We highly recommend this adventure. It is the perfect setting to take all those Atlantic photographs you want to show off to friends and family. Beyond Wells, you can travel 12 miles on Rt. 1 North to visit five beaches in Kennebunk and Kennebunkport, or 12 miles on Rt. 1 South to explore York’s beaches.